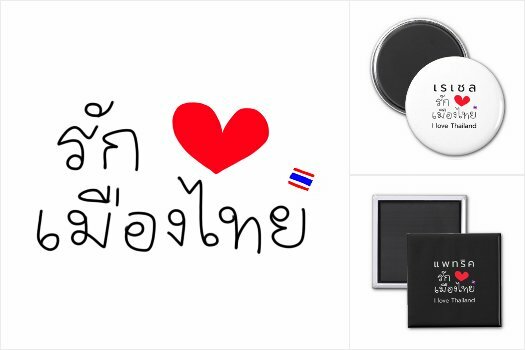 A beautiful and unique “I Love Thailand” design in handwritten Thai script, with a red heart and a small Thai flag printed on various items including T-shirts, mugs and stickers. Products can be personalized with your name or your own text to make them more special. This design is not only unique, beautiful and stylish, it’s also a great way to express your love for Thailand and the Thai language. A perfect gift for yourself or for someone else who’s in love with Thailand and Thai culture. Button with the message “รักเมืองไทย (rak meuang Thai)” (I love Thailand). Above the message is a space where you can put your own name in either English or Thai. If you don’t want to have your name on the button, just remove it. Then, it will just say “Love Thailand,” with “I” being implied. It’s extremely common to omit the subject in Thai, as well as to refer to yourself by your own name. You can find common English names in Thai script here. If you have a foreign or unusual name that isn’t on the list, don’t worry. Send us a message and we’ll transcribe your name into Thai script for you at no charge. Mug with the message “รักเมืองไทย (rak meuang Thai)” (I love Thailand). Above the message is a space where you can put your own name in either English or Thai. If you don’t want to have your name on the mug, just remove it. Then, it will just say “Love Thailand,” with “I” being implied. It’s extremely common to omit the subject in Thai, as well as to refer to yourself by your own name. You can find common English names in Thai script here. If you have a foreign or unusual name that isn’t on the list, don’t worry. Send us a message and we’ll transcribe your name into Thai script for you at no charge. Notebook with the message “รักเมืองไทย (rak meuang Thai)” (I love Thailand). Above the message is a space where you can put your own name in either English or Thai. If you don’t want to have your name on the notebook, just remove it. Then, it will just say “Love Thailand,” with “I” being implied. It’s extremely common to omit the subject in Thai, as well as to refer to yourself by your own name. You can find common English names in Thai script here. If you have a foreign or unusual name that isn’t on the list, don’t worry. Send us a message and we’ll transcribe your name into Thai script for you at no charge. Sticker with the message “รักเมืองไทย (rak meuang Thai)” (I love Thailand). Above the message is a space where you can put your own name in either English or Thai. If you don’t want to have your name on the sticker, just remove it. Then, it will just say “Love Thailand,” with “I” being implied. It’s extremely common to omit the subject in Thai, as well as to refer to yourself by your own name. You can find common English names in Thai script here. If you have a foreign or unusual name that isn’t on the list, don’t worry. Send us a message and we’ll transcribe your name into Thai script for you at no charge. T-shirt with the message “รักเมืองไทย (rak meuang Thai)” (I love Thailand). Above the message is a space where you can put your own name in either English or Thai. If you don’t want to have your name on the t-shirt, just remove it. Then, it will just say “Love Thailand,” with “I” being implied. It’s extremely common to omit the subject in Thai, as well as to refer to yourself by your own name. You can find common English names in Thai script here. If you have a foreign or unusual name that isn’t on the list, don’t worry. Send us a message and we’ll transcribe your name into Thai script for you at no charge. Boxer with the message “รักเมืองไทย (rak meuang Thai)” (I love Thailand). Above the message is a space where you can put your own name in either English or Thai. If you don’t want to have your name on the boxer, just remove it. Then, it will just say “Love Thailand,” with “I” being implied. It’s extremely common to omit the subject in Thai, as well as to refer to yourself by your own name. You can find common English names in Thai script here. If you have a foreign or unusual name that isn’t on the list, don’t worry. Send us a message and we’ll transcribe your name into Thai script for you at no charge. Next: Vocabulary Game: What’s Not in This Picture?